A pig chased after a fitness model as she relaxed on a beach on holiday and bit her on the bum. Michelle Lewin was at the beach during her holiday in the Bahamas when the cheeky swine chased after her and bit her left buttock. The Venezuelan stunner was walking along the sand being filmed when the pig launched its attack. As she twirled on the beach the group of four pigs walked up behind her. One then jumped up and sank its teeth in to her behind as she turned her back to the pack, causing her to scream in pain. As the model ran away from the feisty drove of pigs, they followed and another pig tried to take a fresh bite. She shared the clip with her 13.3 million Instagram followers and over 4 million people have viewed it in the first 12 hours of publication. 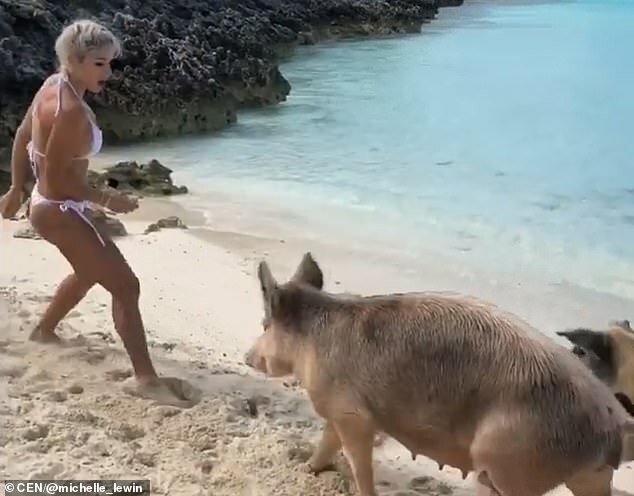 In the viral footage, the blonde model can be seen wearing a skimpy white bikini on the beach as she turned her back to the approaching pigs. In the next clip, Ms Lewin showed off the bite mark on her left buttock to the camera. She was left with a large red mark on her backside. According to local media, the fitness specialist is currently visiting the Bahamas on holiday. She reportedly had a tough upbringing as a youngster and became a fitness model and social media influencer through years of building up her profile to now command millions of fans.